Named after the largest island in the Caribbean, My Father Flor de Las Antillas are hand-rolled premium cigars introduced in 2012 by the world renowned Garcia family. Each of the Flor de Las Antillas are medium to full-bodied in strength and individually hand-crafted in the box-pressed style. Rich flavored Sun Grown Nicaraguan tobacco leaves are used to wrap around a special unique blend of fillers and binders from the regions of Nicaragua. 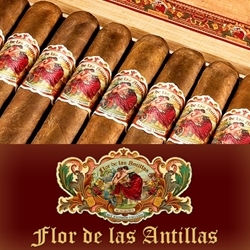 The Flor de Las Antillas line of My Father premium cigars make an excellent choice for any cigar connoisseur. Smokers Discounts has made it easy and affordable to buy these premium cigars online. A variety of sizes and flavors are listed below at our discount online cigar store. Each of these styles are in stock and available. Call us for more details!